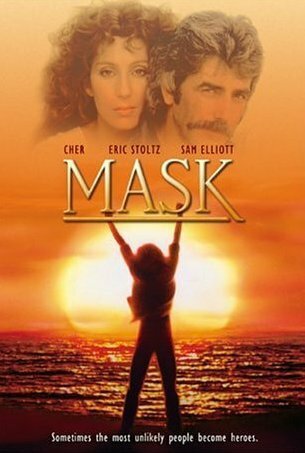 The true story of Rocky Dennis (Eric Stoltz), a personable young man suffering from “lionitis,” a fatal disease which causes hideous facial disfigurement. Son of freewheeling biker, Rusty Dennis (Cher), Rocky is accepted without question by his mom’s boyfriends and cycle buddies, but treated with pity, condescension, and disgust by much of the outside world. The local high-school principal tries to get Rocky classified as brain-damaged so he won’t have to enroll the boy in his school, but Rusty fights for her son’s rights. Once his own life is in order, Rocky decides to wean Rusty off of her drug habit.